How You Can Support Local Conservation Work Today! Our work depends on your generosity. There are many ways you can help! Please donate to help support our efforts to restore and protect our local watersheds. Thank you! Help our Steelhead in the Classroom program get new equipment and supplies! A threatened run of steelhead trout inhabit the Petaluma River, which runs for 18 miles through Sonoma and Marin Counties in Northern California. Steelhead trout in this watershed are listed as threatened under the Endangered Species Act, and it has been given priority status by the National Marine Fisheries Service. Click here to learn more and donate today! ~ You Shop. 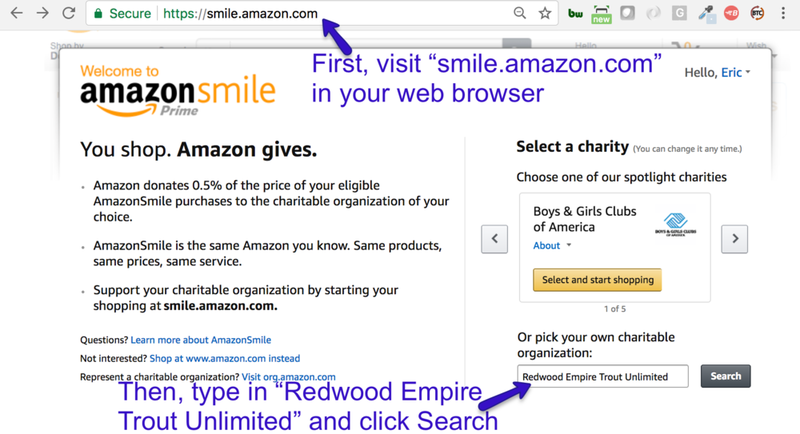 Amazon Gives - to Redwood Empire Trout Unlimited.